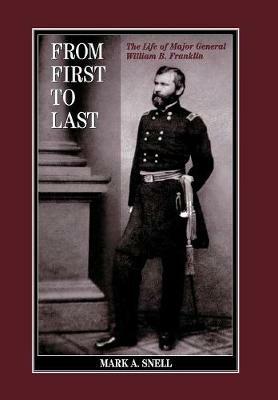 From First to Last is complete life story of one of the most controversial yet least well known generals on either side during the Civil War. The number one graduate of the West Point class of 1843, William Buel Franklin served in the U.S. Army's Corps of Topographical Engineers and contributed greatly to the building of the nation's internal improvements, including a stint as chief engineer in charge of construction of the U.S. Capitol's dome and extension from 1859 to 1861. During the Civil War Franklin ascended rapidly in rank and command authority, from command of a Union brigade at Bull Run, to leadership of the Sixth Corps of the Army of the Potomac on the Peninsula and during the Maryland Campaign, to command of the Left Grand Division, of that army at the terrible Battle of Fredericksburg. In the wake of Fredericksburg, Franklin was unjustly blamed for the Union army's defeat, not so much because of his generalship-or lack thereof-but because of his politics and the highly-charged political nature of high-level leadership in the Army of the Potomac. Censured by the notorious Joint Congressional Committee on the Conduct of the War, Franklin was banished to the Department of the Gulf, where he participated in the ill-fated Sabine Pass Expedition and Red River Campaign. Wounded during the Red River Campaign and captured by Confederate partisan rangers Franklin would escape his captors but could not escape the wrath of the Lincoln administration, which refused to place him back in command even though his old West Point classmate-U. S. Grant-personally requested his services. Franklin resigned his commission in 1866 and began a highly successful post-war career as Vice President and General Manager of Colt's Firearms Company in Hartford, Connecticut. A respected citizen of that city, Franklin continued to serve his country in a number of public positions, including leadership of a government bureau that eventually became the U.S. Veterans Administration. Snell's study of Franklin is evenly balanced, correctly pointing out Franklin's flaws and lapses of judgment-such as the Battle of Crampton's Gap on September 14, 1862-but giving him credit where he received none in the past. Snell provides readers with a complete picture of Franklin: brilliant engineer, doting husband, respected businessman, and controversial Union general. From First to Last will change the way historians interpret this important figure of American history. The author moves the story along in a manner both easy and interesting to follow." "(The book) will have appeal to both military history enthusiasts and scholars.